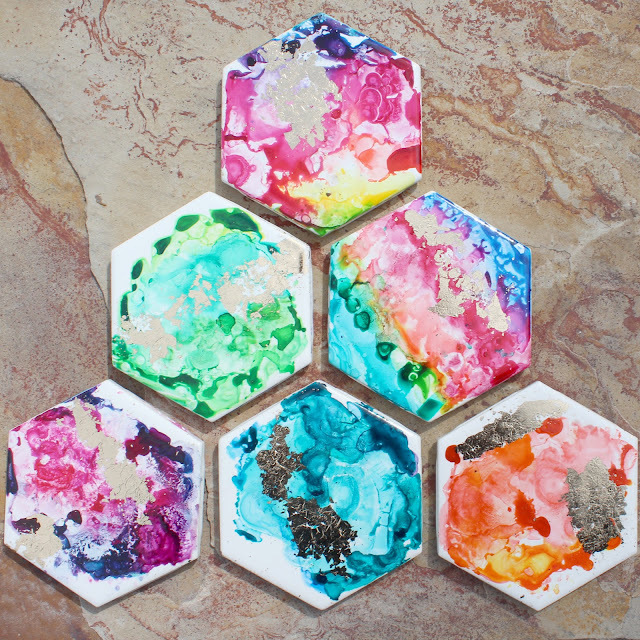 Doodlecraft: Watercolor Alcohol Ink and Gold Leaf Coasters! 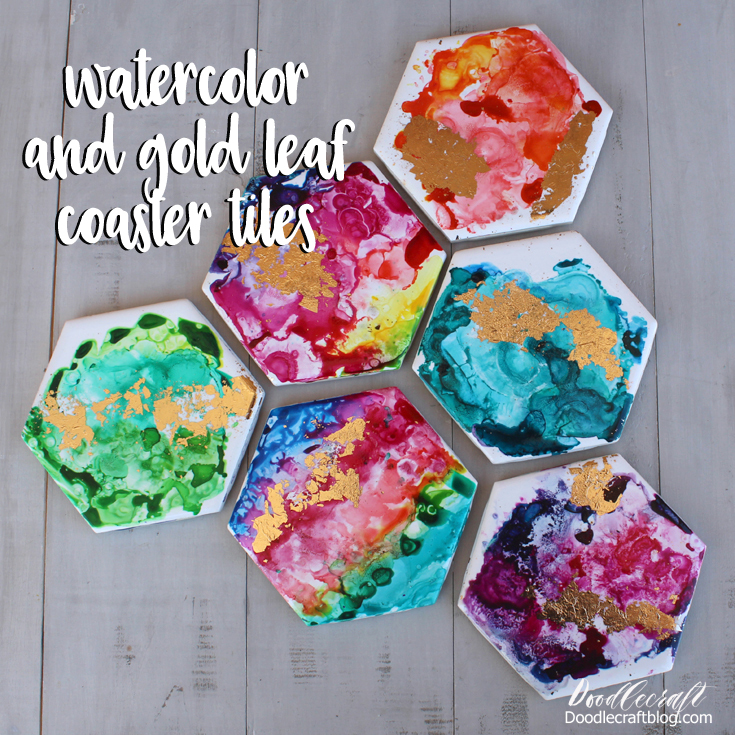 Watercolor Alcohol Ink and Gold Leaf Coasters! I love the bright colors and shimmery gold! maybe of my whole life. I am so excited with how gorgeous and elegant these turned out! In the sunshine they sparkle and shine! They are colorful and bright. They have the perfect metallic element, just a splash of gold! They are simple to make. Really, these don't take much time. They are simple enough for older kids to give it a try too. And if you mess up, you can wash it off and try again. You don't have to commit until you love it! they were under 50 cents each. I love them--I need a hundred more! You will also need Alcohol inks. These Dr. Ph. Martin's Bombay India Inks are perfection. They are bright and vivid and don't lose color when they dry. I use them a lot...check out this post too! 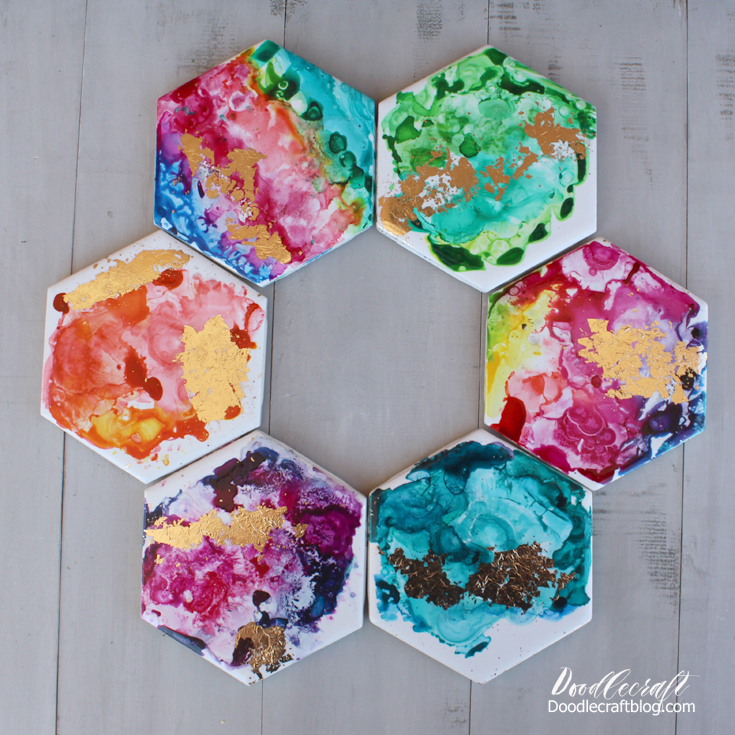 Okay, inks, tiles and rubbing alcohol...you'll want a palette and paint brush too! You'll also want gold leaf and adhesive! The gold leafing isn't essential. but the gold gives it such a wonderful finishing touch! Put some drops of ink in the palette. This makes it much easier to work with. it off with warm water and start over! Dip the paint brush in the desired ink. Don't dilute it with water. Paint right on the tile! Add other colors...colors that compliment. Colors that blend well and don't turn to brown. shades of reds and oranges and yellows. I think three colors works great. I love the ones with all the colors the most though! One more color on the edge. You don't have to fill the entire tile. Leaving white space is the sign of a great artist! Then take the rubbing alcohol and just add a couple of drops right on the tile! It instantly repels the ink. Drop it from about 8 inch height. This gives it the right splash! It creates the most amazing patterns and designs. It's fun how the colors mix and blend! Here's a video of the painting process to give you more confidence! As if it wasn't easy enough! You'll want more than 6 tiles...like hundreds! You'll want to make these for gifts too! I let them sit for just a couple hours. so you can lacquer them here...or move on to the next step. After they are dry, it's time to gold leaf! It's so fun too--and highly addictive. I only use one sheet of gold leafing for all 6 tiles. Cut one sheet in 6 slices. It's super thin and breaks apart easy. Just cut it with the layer paper with it. Don't pick it up until you are ready to work with it. Add some adhesive with a small paintbrush in a few places on the tile. This will remove the paint, so be careful. Just add the adhesive in a random place and pattern and let it dry completely. Once dry, add the strip of gold leaf. Press with your finger on the areas that have the adhesive. Use a fluffy paintbrush to "dust" the gold. This will gently remove the leafing from anywhere there is no adhesive. Some of the tiny pieces will stick to other parts of the tile. This is fine and actually makes it look so much cooler. I think it needs the gold, it's the crowning glory! I love a metallic element. You could use copper leaf, silver leaf or variegated gold leaf! Then place on a piece of cardboard and take outside. Spray with a coating of lacquer. Let sit for 20 minutes and repeat. The lacquer will dry shiny and crystal clear. I let mine dry completely overnight. Hot glue some felt, foam or cork on the underside. here's me using some of that cork! Cut a little smaller than the tiles. Then hot glue all the edges and press on firmly. They look fantastic stacked--I even love the messy edges! Now they are ready to use as coasters! They shine in the sun! Keep track of your drink! Please like, share, comment, pin, and follow! Or save off for later! Only issue is its not practical since if the cups are wet they act like suction cups, that is why the good coasters always have some sort of groves in them to prevent the suction. I was going to suggest lacquer to waterproof it until I got to the end. 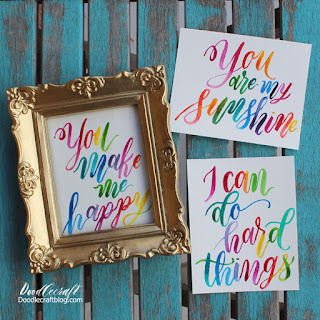 These are cute, and would make a fun craft for the whole family. This looks like such a fun and bright craft! I love how these catch the light! I also appreciate that they don't look that hard to make, and that they're frugal. Thank you!